One of the most frequently discussed subjects on the SurLaLune Discussion Boards is the usage of fairy tales in advertising. 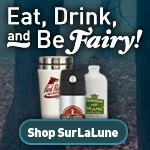 Over the years since I launched SurLaLune, I've noticed and watched many advertisements using fairy tales. Tonight I saw one of my favorites to date. It must be recent although I admit I don't watch much television and when I do, I usually fast forward the commercials, so it was fun to catch this one in quick motion and then rewind to watch it slowly. I think one of the reasons I enjoyed it so much is that it uses a popular fairy tale which for some reason isn't used in advertising very much. Little Red Riding Hood, Cinderella, Frog Prince and the Three Bears are used much more often. I have a hard time remembering any Hansel and Gretel usages and this one fit the bill perfectly. I'll embed a version I found on YouTube, but I'll still explain that it is for AT&T and they used the Hansel and Gretel story wonderfully. I had to watch it twice and I smiled both times. And, no, I don't mind the usage of fairy tales in advertising. I find it rather satisfying to see that fairy tales remain a viable part of pop culture. I chuckle every time I see this commerical. I was thrilled to see this commercial the other day. Currently this is my favorite fairy tale - simply because I've been enjoying exploring it with my 5 year old daughter. She is completely enchanted by the story. We own three illustrated versions of the story (Jen Corace, Paul Zelinsky and Susan Jeffers) and I like them all fairly equally. She also really enjoyed the Faerie Tale theatre version.